At Brightleaf Dental in Santa Monica we understand that life after tooth loss can be difficult. 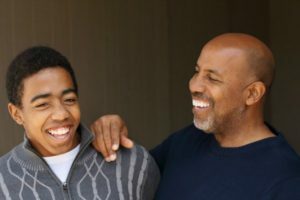 For many who have lost a tooth due to age, decay or a dental injury, it can be a challenge to eat or speak comfortably, and to smile with confidence. A healthy smile requires the teeth to work together to support the jaw, bite alignment and surrounding tissues. When you come in to see your local dentist in Santa Monica, Dr. Satvat will partner with you to find the best solution for your specific needs. If you desire regaining your beautiful smile, give us a call at (310) 395-1810 to ask us about dentures and tooth replacement in Santa Monica. You might already know that here are multiple options available for replacing missing teeth. These include dentures, dental bridges, and dental implants. Dental implants can be a very good option to replace missing teeth, but they aren’t for everyone. Modern dentures are natural looking and comfortable forms of tooth replacement. Made up of multiple replacement teeth attached to a gum-colored thermoplastic or other economical material, each denture is custom designed to rest comfortably in the mouth and support a natural looking, fully functional smile. Using dentures, patients are able to eat, talk and smile more naturally than when one or more teeth were missing. When you come in for your appointment we are happy to guide you through your denture options to find the right fit for your needs. Signs of aging such as wrinkles and lines form around the mouth over time, but can also occur with an ill-fitting denture. At Brightleaf Dental, we provide neuromuscular dentures to raise the bar of what patients can expect with dentures that reduce signs of droopy facial wrinkles and can take years off of the face. Neuromuscular dentures are specially designed to fit precisely within the mouth and form a harmonious relationship between the mouth, jaw, neck and denture teeth. By involving all aspects of the body to work in harmony with the new denture, patients achieve a functional smile with an improved face shape, smile and cosmetic appearance. Full dentures, also known as traditional dentures or complete dentures, are removable and can replace full sets of missing teeth for a radiant new smile. Cosmetically pleasant in design and versatile in functionality, traditional dentures provide a comfortable fit that looks and feels natural. Thanks to modern advancements in dental technology, full dentures are now built to last longer, fit more comfortably, and look beautiful. Restoring your smile after losing one or more teeth is possible with removable or fixed partial dentures. 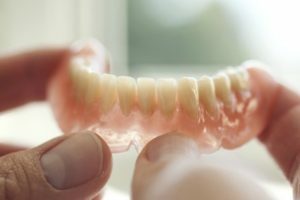 Partial dentures are designed to match the natural shape, size and color of the teeth in a way that complements each patient’s unique personality and natural beauty. Partial dentures can be removable or fixed, where fixed partial dentures are secured to neighboring teeth using precision attachments. This is also known as a dental bridge. If you do opt for dentures, we will make well-fitting custom dentures and advise you about how to take good care of them while at home. With lower dentures especially, you may need adhesive support to secure them into place. Caring for your denture is relatively simple but may take some time to get used to. For the best transition into a full, beautiful smile with dentures, Dr. Satvat and her team are happy to guide you through what you need to know to lead a happy life with your new, full smile!